Free parking is available in our lot, on Irving Park Road, and Joe Sieb center (located a half a block west of the restaurant). The Edelweiss is the perfect place to host your special events and parties. Whatever the style or budget, the Edelweiss has a package that will make your event or party a time for all to remember. Whether celebrating a special occasion with family and friends or hosting a corporate event, Edelweiss Restaurant can accommodate all your special event needs. We offer a semi-private back room can seat up to 110 guests and our seasonal beer garden can seat up to 40. 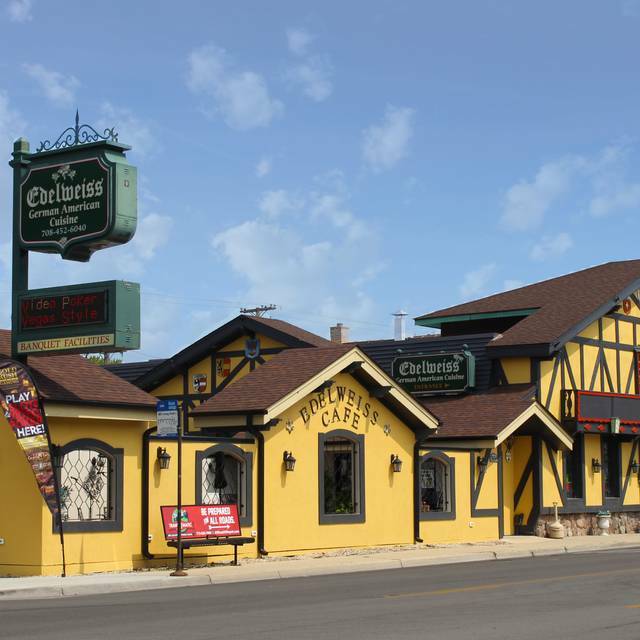 Edelweiss German-American Restaurant is one of Chicago’s favorite German restaurants. It has been a family-owned dining destination for over 30 years. 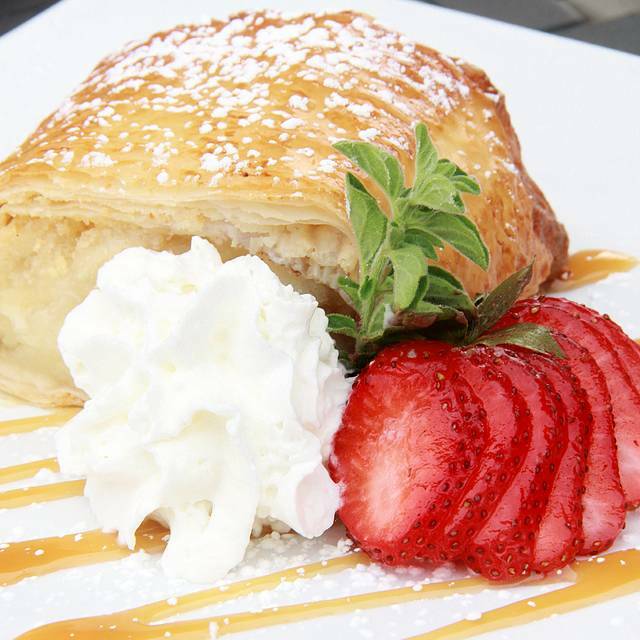 The menu features an impressive array of traditional, well-crafted German specialties along with classics like the American steak, chicken and seafood dishes. A gluten free menu and kids menu are also available. We offer 16 beers on tap as well as a variety of craft and international beers, wine and schnapps. Our bar area is an excellent venue to watch sports and play the slot machines while enjoying our daily bar and menu specials. Corned beef topped with sauerkraut, Thousand island dressing, melted Swiss served on rye bread. 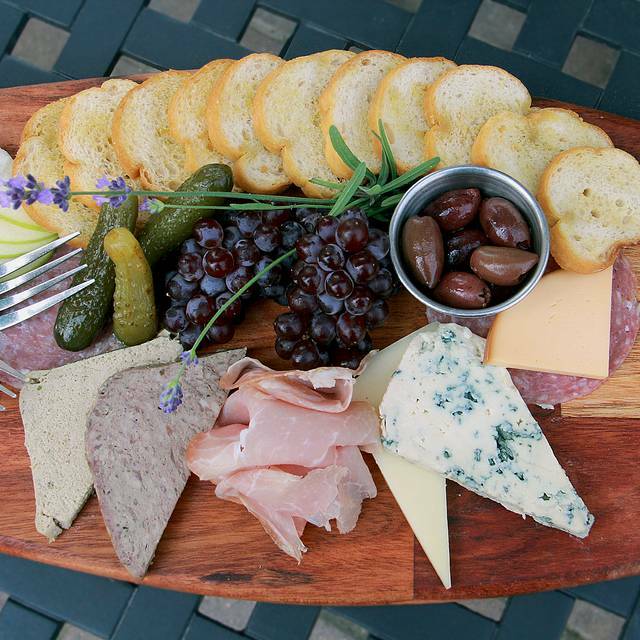 Enjoy one of our 1/2 Price Featured Appetizers available on Fridays 12-4p in our bar area. Come celebrate Mother's Day weekend with us! A special Mother’s Day menu will be available on Friday, May 10 through Sunday, May 12. Seating times are available for Sunday, May 12 at: 12:00pm, 2:00pm, 4:30pm, and 6:00pm . Moms will receive a fresh flower in honor of their special day. We will be featuring a special Easter menu including Bavarian Baked Ham, Maple Glazed Stuffed Pork Tenderloin, and a Pilsner Braised Lamb Shank. Book online or call 708.452.6040 and make your reservation today! We were warmly welcomed when we arrived and immediately seated in a cute booth with many interesting things to look at. We felt like we were inside a fairytale Gingerbread house! Despite the dated decor everything was very clean. Our waitress was friendly and helpful- I asked for recommendations and we ordered all of her favorites. My husband and I both enjoyed everything. The food was good but the service was amazing. The waitress, the busboy, the manager and even the bartender whom we didn’t really deal with, were all so helpful and friendly. They made us feel like family. It’s quite a distance from our home but we will definitely make the and return! Family gathering with fond memories of family gatherings back in the day! Delicious food and ambiance!! I set up a trip with the Berwyn Park District to Edelweiss Restaurant for a group of Active Adults and they all absolutely loved it! The restaurant was very easy to access, the wait time was short, they were able to accommodate a lot of tricky situations (10 separate checks, lots of substitutions, etc) with ease, and the best part, the food was very authentic and very delicious! I would highly recommend Edelweiss for a casual dining experience with a good selection of food, beer, and cultural dining. Extra thanks to our servers Katrina and Jose for their help that day! I am not sure what to think --we walked into this restaurant and the first thing we see were slot machines. Not quite fitting for what really is a family restaurant. Our bread was cold --from the fridge-not fresh. I would have liked to see more than 1 slice of pumpernickel! Soup came out lukewarm, entrees tasty (wienershnitzel) cabbage side was bland. A nice selection of desserts. Not sure I would recommend this place to my true "foodies" but if in the neighborhood, it would be an ok place to stop by, despite the ugly slot machines out in front! The waitress are always so nice and efficient we LOVE coming here. We were with a group for St. Patrick’s Day and had a wonderful time. The music added to the ambiance. This a real home kitchen place. I'm talking about how when you were growing up and you and your family spent the evening eating a big family meal together. Well Eidelwiess does this ten times over. You feel like you are in your family kitchen having the very meal you're ordering from their menu. Excellent place. 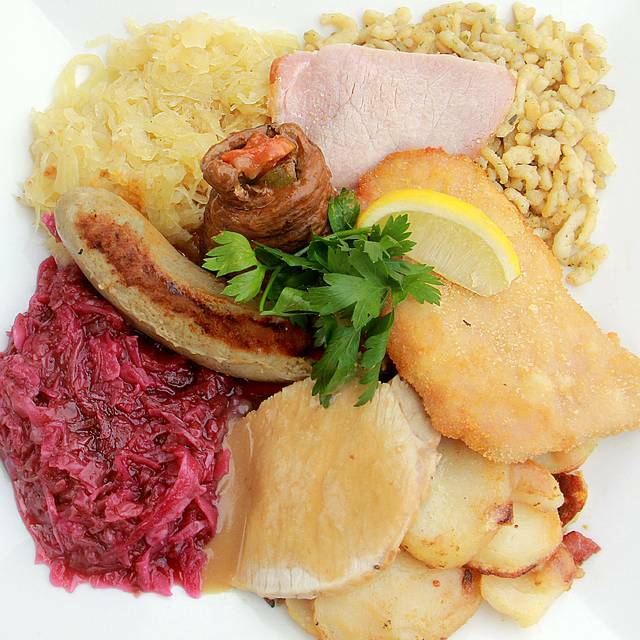 We were interested in having German cuisine for dinner, and we were very pleasantly surprised! This was possibly the best we've had! All of the items were prepared to perfection and the presentation was very appealing. We would definitely recommend it to anyone! Great place for German food. As a Lincoln Square couple, we were saddened by the closing of the Chicago BrauHaus. We took our mother out for her birthday dinner tonight to Edelweiss and we were so completely happy with our experience. Dawn, the manager was lovely and welcomed us with Apfel Schnapps. The food was excellent! Best liver dumpling soup around! Jacob, the house musician was so much fun and played our mother’s favorites. The wait staff (props to Kayla in particular) was excellent. Save room for those deserts! Thank you Edelweiss for a great night-see you soon for a night on the outdoor patio! Great food and beer with some Smiling Staff. Kathy took great care of us. The Hackepeter was so delicious. The food was excellent, but my wife and I were there for almost 2 hours for what should have been no longer than a 1 hour meal. Granted, there were a couple of large groups there that evening. But, overall, it took a very long time for each step of our meal: We ordered drinks (excellent beers) and shortly after that arrived we ordered a pretzel (also excellent). At some point in this process we got a different waitress, it appeared our original waitress was quite busy. 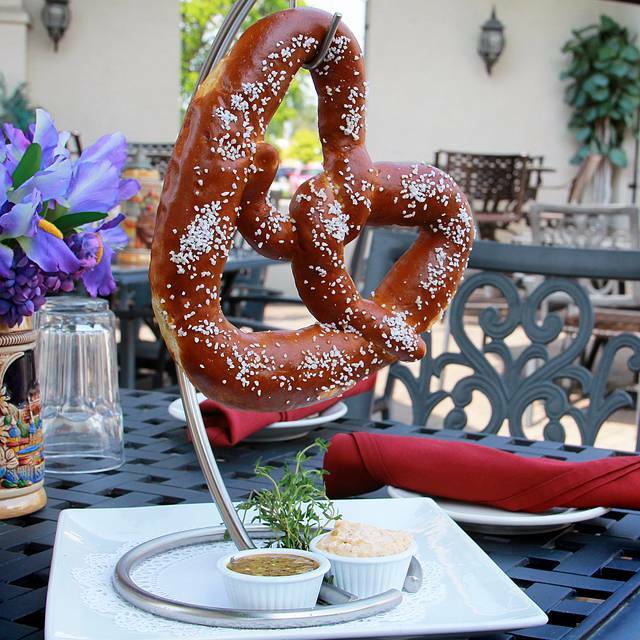 Our entree order wasn't taken until we have finished with the pretzel. Then began out longest wait of the evening. On the upside, there was live music helping to keep us entertained. I asked for another beer, which arrived almost immediately. It was explained that it had been poured by mistake for another table. I'm not convinced, however, that it was the variety of beer I had asked for. Nonetheless, it was pretty good. Our food was promised a couple of times. Eventually I flagged down our waitress and she promised "it will be right out." She asked another employee to bring it out to us, and it came almost immediately. It made us wonder how long it had been sitting there waiting to be brought out. The waitress offered excuses of the large groups and an increasingly large to-go business. No compensation for the extreme wait was offered (and I didn't seek it), though the last beer was not added to the bill, likely due to the mistake regarding the other table. Overall, we me go back at some point, but we'll be wary. Excellent food and service always. Great authentic German food. One of Chicago areas best German style restaurant by far!! Never have had a bad experience. Went for Valentine’s Day with my mom and daughter .. Everything was fantastic as always .. We’ve been going there for many years and will be back ..
We love this place from top to bottom. Took 90 y/o father-in-law, with spouse, daughter, son-in-law and two grandsons, aged 3 and 1 on an early, 5 pm Sunday night. Josephine was an awesome server, busboys are incredibly efficient and food as good as ever, with huge portions! Only negative: only one oompah bandsman. He played sax, clarinet, and accordion with canned music/polka’d. He was great and we danced with grandsons. But we missed the other musicians as website said they’d be there starting at 3 p.m. The food and choices were very good, but the staff was fantastic! Lovely experience. Fantastic food. Warm, old-world hospitality. Outstanding and authentic German grub and beers, very friendly server/managerial staff, fun atmosphere coupled with great live German music. Great German food, great helpful staff. Overall a great place to meet family and friends. Food and service was wonderful! Have been going there for years and more to come. Had dinner for a birthday celebration. Edelweiss is between chief chefs. It shows. The liver dumpling soup was dark and greasy. was below average. Their duck, which, we travel here for, was below average. If the duck, which they were once known for, is below average. Even the Grand Marnier sauce was not that good. Red cabbage was good. Spaetzle - average. What a disappointment. The food is not flavorful. If You can cook better than the restaurant, that is not a good sign. Look elsewhere. Was definitely a find of an authentic German restaurant. Weiner Schnitzel ala holstein was said to be delicious and not a crazy upcharge as seen in other establishments. My husband enjoyed creating his own 4 beer tasting. I being a vegetarian was extremely happy to see a dinner offering of a great vegetarian plate with all my favorites- potato pancakes, spaetzle, red cabbage, grilled vegetables and a lovely firm tomato grilled with a cheese topping centering the plate. Kudos goes out to the management for reading the Open Table reservation and surprised both me and my husband with a comp birthday dessert for him. After realizing it was just a 35 minute trip to Edelweiss from our home, we shall definitely be returning. Made our New Years reservations on-line where it had a menu with popular items. When we got there only had 3 choices and appetizers we wouldn’t normally order. Disappointing is an understatement. Chocolate torte was a cupcake. No shots served. A few sips of champagne - no refills. So much better last year. Not worth the drive in from Glenview. Oh - band was ok but no Johnny Wagner? 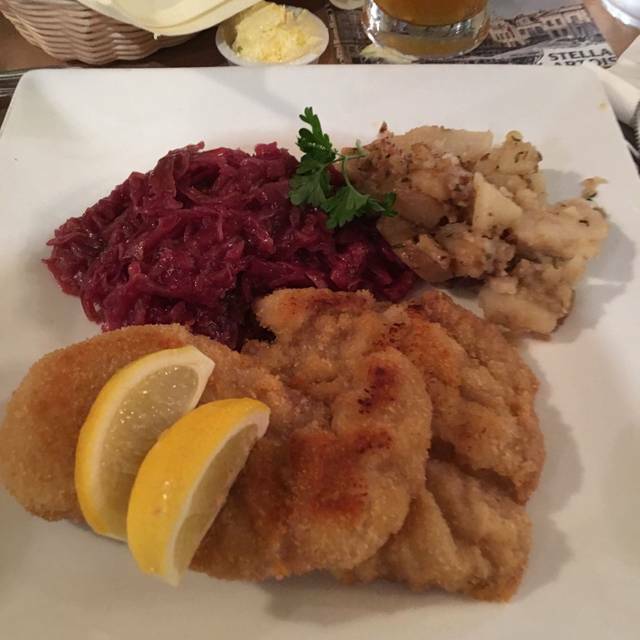 We Loved the German food selections and the service was great. We are repeat customers; usually visit 2-3 times a year. The food is outstanding German/Eastern European. However, if there were a higher score than "Outstanding" for service, we would have given it. We wonder how this restaurant manages to find severs who are all friendly to the extent of the servers here... and look like they genuinely enjoy their jobs - while others seem unable to come close. They make the experience! Also, kudos to hostess Dawn. She's been there since our first time; don't know if she is a family member but if she isn't she takes care of the customers like she is one. You must try the Weinerschnitzel! So much food, a bit pricey, but it was the holiday menu so im guessing the regular menu has more options. 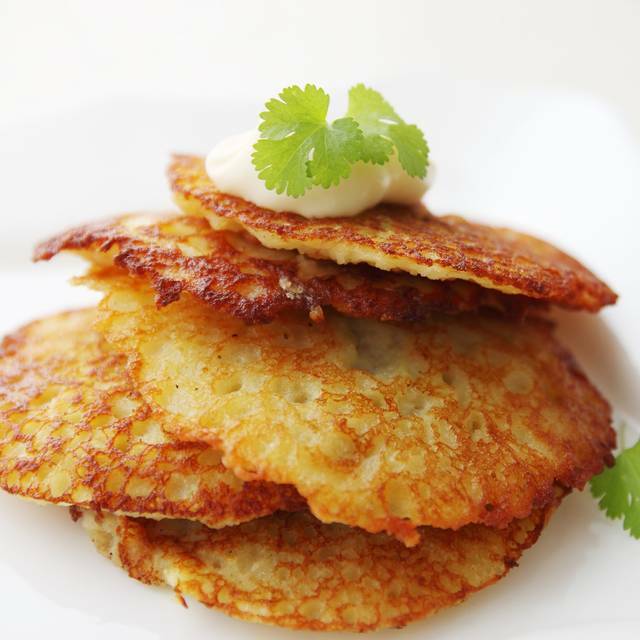 We had a meat and veggie tray and potato pancakes for apps which was very tasty. Our dinners were schnitzel and the duck, which were both great and the salmon which was average. The hostess is fabulous and elevates the experience as she is really so welcoming you really want the rest to be perfect. Service was good, timed well, and even the gal training did great. We have been there many times and always enjoyed it. The have real Wiener schnitzel made with veal.